Fast and filling. Perfect for those days when there's just not enough time. This may not sound like much of a post, but there’s method to my madness. We’re coming up on the busiest week of the year for many people. Most of us are pedaling as fast as we can. Time is of the essence. This recipe is fast, fast, fast. Don’t blink or you’ll miss yourself making it. And it does have an intriguing name, doesn’t it. How in the world do you roast a sandwich? Well you can, and it’s one of the best ways to toast bread and melt cheese at the same time. I’m in a bit of a kitchen panic this week. I’m on the push to finish making gourmet goodies for Christmas, but I work all day. So I need to free up my nights. This was perfect. Actually I can imagine all kinds of times this would be perfect. It’s a pretty simple sandwich, really. It’s just the technique that’s a bit off the wall. 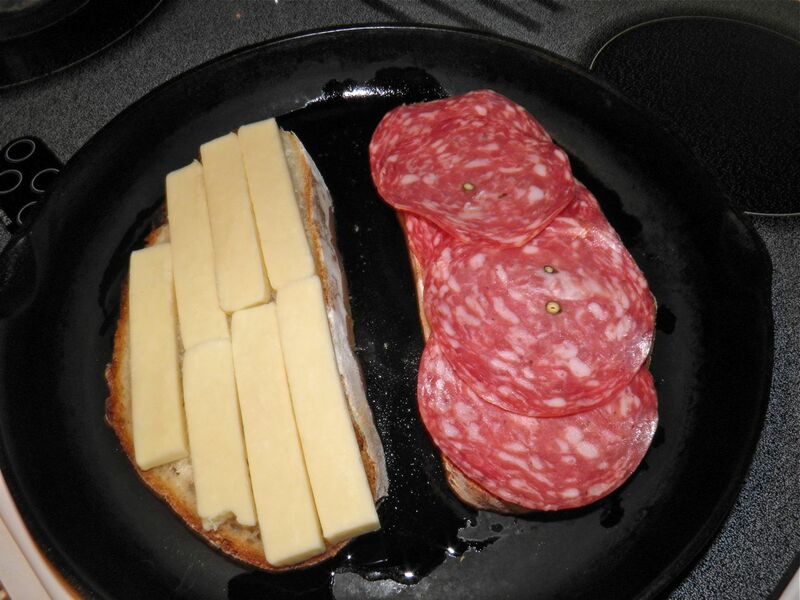 The trick is to brown the bread in a frying pan and then let the oven melt the cheese and heat the meat. Usually when you make a sandwich (like a grilled cheese) the bread is a bit over-browned by the time the cheese melts. Not so in the oven. From there you simply add the fillings you don’t want heated (tomatoes, mayo and basil), close it up, cut in two and enjoy. You don’t even have to wait for the oven to come to full heat either. The recipe uses the heating oven to do its magic on the cheese. This technique also has another secret benefit. The bread doesn’t even have to be fresh. Mine was because I just made it on Saturday,but you can use older bread too. There’s an Italian “recipe” (if you can call it that) that is extremely addictive. It’s fried bread with olive oil and salt. Once you try it you’ll be converted. From that point onward you’ll look forward to your bread going stale. This is one sandwich. My pan wasn't big enough! This sandwich uses the same delicious technique. If you’re in a rush, or are looking for something filling for lunch try these sandwiches. Fillings can be modified to suit your own tastes. 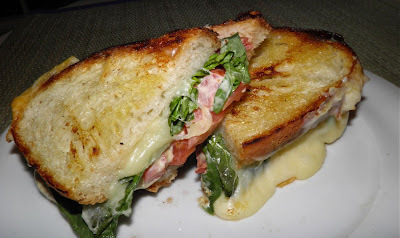 The result is a meaty, cheesy warm sandwich with plenty of basil bite and crunchy, tasty bread. What's not to love? Turn the oven to 450°F. Heat the olive oil in an oven-proof large frying pan. Place the bread in the pan and swirl it around to coat with the oil. Use a little more oil if you wish. Slice the mozzarella into 1/4” thick pieces. As the bread toasts in the pan, arrange half the salami on two of the slices and the sliced cheese on the other two. Once the bread has started to brown place the pan in the heating oven. Let cook in the oven for about 8 minutes, until the cheese has melted and the salami has started to curl slightly. Meanwhile, to make the dressing mix together equal parts of Dijon mustard and mayonnaise. Season generously with pepper. Slice the tomatoes and tear the basil leaves. Remove the pan from the oven. 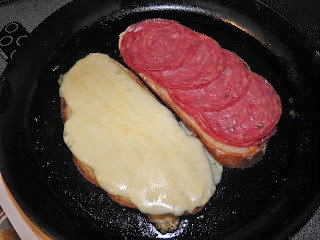 Arrange tomato slices on each of the salami topped bread. Sprinkle with salt. 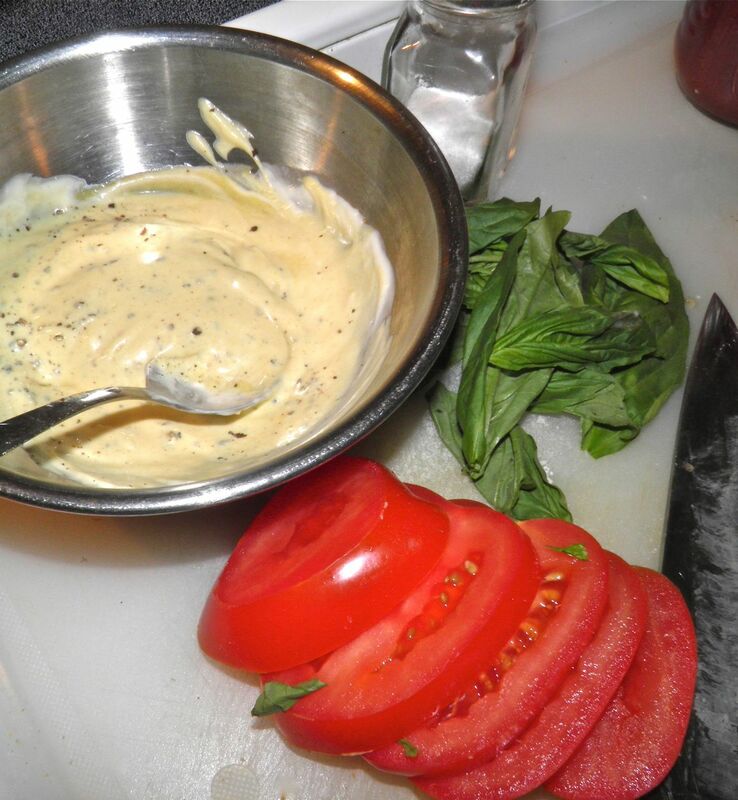 Place some dressing on top of the tomato slices and then top with basil. Flip the cheese topped bread on top of the other halves and remove to a board. Cut each sandwich on two and serve while the cheese is still warm and stringy.